The Raving Queen: Choo! Choo! To Petersburg, Girls!!!!!!!!!!!!!!!!!!!!!!!!!!!!!!!!!!!!!!!!!!! Choo! Choo! To Petersburg, Girls!!!!!!!!!!!!!!!!!!!!!!!!!!!!!!!!!!!!!!!!!!! All aboard for the Suicide Express, darlings!!!!!!!!!!!!!!!!!!!! I don't mean to minimize the tragedy of suicide, (With my experiences?????? How could I?????) but even those who have never read a word of Tolstoy's masterpiece know two things about it, up front--the opening sentence, detailing family dysfunction, and Anna's climactic rendezvous with an onrushing train. The mistake many make is they think this is all it is. 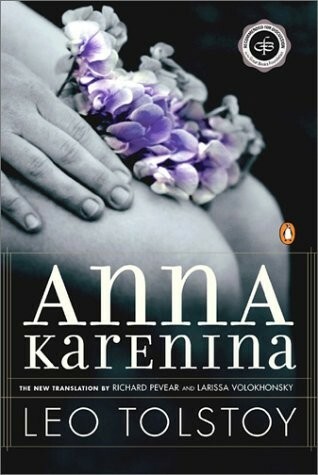 I have just completed my third reading of "Anna Karenina," and I have to say it was my most satisfying. Part of it was the wonderful translation by that superb husband wife team of Richard Pevar and Larissa Volokhonsky. The other was, reading it at my most mature yet, I discovered certain things I never realized before. This is not just some tumultuous romance about a woman who falls. Yes, there is that, but if you look elsewhere, you discover a story filled with romantic obsession, mental instability, class awareness and social indifference, counterpointed by meditations on life. It is much more engaging a book than I had previously thought, and, while I still, and always will, consider "War And Peace" to be the better of the two, I came away with more admiration for "Anna Karenina" than I ever had before. Levin, who, in previous readings, I found as annoying as a gnat that I just wanted to swish away, I found a person of character and substance, probably the most grounded in the entire novel. Vronsky is not the villain one might think, nor Anna the hapless victim. The real villain is her husband, Karenin, and the way he abuses social conformity to get even with his already deflated ego. With Anna's poor son, destined to be traumatized for life. Believe me, dolls, if there was homosexuality in Russia, back then, I predict, once he hits puberty, Anna's son, Sergei, will go in search of his own pleasures and to hell with his father's conformity, which he shoves down the poor child's throat. I also admired Kitty more; she has more dimension to her, and is not the simp I at first thought. Epic, panoramic, but also psychologically probing, I am glad I made "Anna Karenina" my BIG book of the Summer. Even as I move on to more fun things, darlings, it will be hard to let go of. This reading changed how I looked at the work, in general, and if you have not read it in awhile, I think it will change you, too. If you have never read it, darlings. what on Earth are you waiting for--Cliff Notes????????? Tolstoy would turn over in his grave!!!!!!!!!!!!!!!!!!!!!!!!!!!!! !